Join us for a friendly game of golf at Belmont Hills Golf Course. 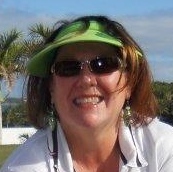 Email Cheryl to be added to the weekly Paperless Post invitation list as we need to know how many tee times to reserve. When: Every Monday (except holidays and tournament days), first tee time at 9:30 AM September through May. During June, July and August – 8:30 AM. Cost: $45 for 9 or 18 holes includes a shared cart (cart path only) or push cart. Some of us walk the front and ride the back. It’s the same price whichever way you get around the course – the best golf deal in Bermy and only available on Mondays. Walking vs riding: I suggest walking 9 holes until you develop straighter shots. If you’re driving you have to keep the cart on the path at Belmont and you end up doing more walking back and forth across the fairway from cart to ball and back for different clubs. When you walk with a push cart you go directly to your ball and always have the right clubs with you. Pace of play: The course is selling time slots of 4 to 4 1/2 hours on the course and expect each group to clear each hole in 10 to 15 minutes. That’s hard when you’re starting out. Here’s three ways to have fun while playing within your time slot. 1. Pick up the ball halfway down the fairway and move on to the next tee. 2. Forget about the tee boxes – tee up halfway down the fairway and play out from there. 3. Or just play the green – chip from just off the green and putt out. Ready Golf: Anticipate your next shot – you should take several clubs with you for when it’s your turn. Take the club you think you’ll need and one up and one down. Don’t slow down the pace of play by walking to your ball without any clubs in hand. Practice Swings: A practice swing on the tee box helps you to warm up. Then with difficult shots it’s a good idea to take 1 or 2 or even 3 practice swings to get the feel of the “lie.” But if you need more you should consider spending some time with a pro who can help you develop an efficient pre-shot routine. Golf Etiquette: Please be quiet while others are preparing to swing. Don’t stand in the way – either in front or in back – it’s dangerous and distracting. Playing Through: If a group of golfers is waiting behind you for a couple of holes invite them to play through by waving them through. They’ll appreciate it and it takes the pressure off you. Then move to the side of the fairway. Take cover behind your cart or a tree – they might get a little nervous about having an audience and shank the shot. There is a downside to letting a group play through – it takes time for them to play out the hole while you wait for them and you’re now over your allowed time and another group may be right behind them waiting. So only do this if the course isn’t busy. It’s better to skip holes to keep up pace of play. Questions or concerns: Call me at 331-6000.